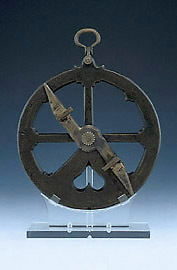 Like many surviving mariner's astrolabes, this example was brought up from the sea bed. The instrument was found during dredging work in 1903 at Vera Cruz harbour in the Gulf of Mexico. Only the cast bronze circle and suspension were recovered; the alidade is a modern replacement. There is a scale for both altitude and zenith distance in the upper left quadrant. The only other marking on the instrument is an unidentified 'A' surmounted by a star at the base of the lower ballast section.